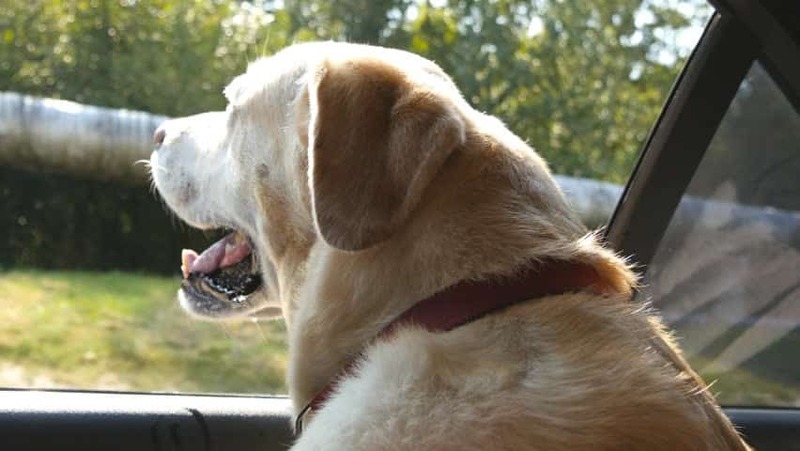 Many pet parents are oblivious to some of the dangers of traveling with dogs in their vehicle. My hope is that you will save you and your dog’s life and health by reviewing these few VERY important tips you may never have thought of. Especially in the warmer states, dogs are often injured when jumping from the bed of a truck. This can lead to broken bones, if the truck isn’t moving, or much worse injuries if it is moving. Also, many dog owners allow dogs to constantly jump in and out of cars which is especially harmful to dogs under 24 mos old whose growth plates are still forming. This can lead to serious elbow and hip issues, torn ACL, and early arthritis from the constant pounding on those joints. It is recommended you get a simple ramp for your pet. Having to pay thousands in vet bills for medications and possible surgery make this a no-brainer. Injuries are also likely when a dog jumps from the car window, whether the car is moving or not (we had one of our stud dogs do this—snapped his femur!). Some pet owners open the window for their dogs, whereas some dogs might open the window by pushing on the button by accident. Either way, I cringe every time I see a dog with his head out of a car window. Also, if you have to swerve or brake suddenly, the dog can be ejected from the vehicle. Be sure to use a good dog restraint at all times. Even if your dog doesn’t jump, he can develop eye problems like conjunctivitis from the wind and flying debris. Dogs should never be allowed on your lap or left to wander in the car. They, or their carrier, should be secured with a seatbelt. Otherwise, they can become flying objects during an accident, which can hurt them and other passengers. Thank you for reading this and being a responsible pet parent! !